What is the Klinger Volume Oscillator? What signals does the KVO indicator gives? Which tools can we combine with the Klinger? The Klinger Volume Oscillator (KVO or KO) is a volume-based indicator, which assists traders to identify a longer-term view of price trends. Since the KVO is a leading indicator (oscillator), it is not a great standalone trading tool. 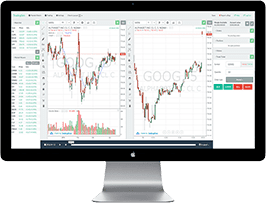 For this reason, traders often combine the KVO with other trading indicators in order to achieve higher accuracy when making trade execution decisions. It resembles a cardiogram, don’t you think? If you haven’t used the Klinger Volume Indicator before, you would probably consider it pretty chaotic and unorganized because of the strong fluctuation of its most important component – the blue line. The blue line on the image is the KVO line. This line is a calculation of the difference between the 34-period and 55-period EMAs, which day traders call “volume force” (VF). 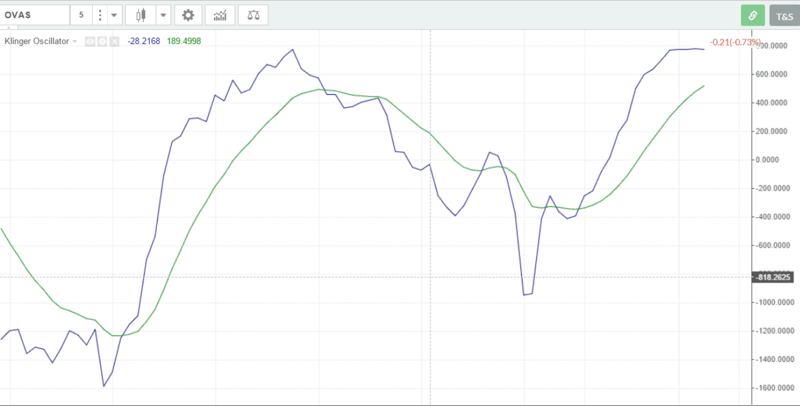 The green line is a normal 13-period EMA, which averages the fluctuation of the KVO line. Since the green EMA averages thirteen periods of the KVO, we have many interactions between the two lines, thus creating the most common signal of the Klinger Volume Oscillator Indicator. Whenever the blue KVO line crosses the green 13-period EMA, the KVO indicator signals an eventual move in the direction of the cross. The other important signal of the Klinger Indicator is the divergence. We get a bearish divergence when price increases and the KVO is negative. Conversely, a bullish divergence occurs when the price is decreasing and the KVO line is positive. As you see, divergences by the KVO work the same way as most other oscillators. While the price of Coca-Cola was increasing, the KVO indicator was decreasing steadily. Shortly after this divergence appeared, Coca-Cola quickly dropped one dollar. Nevertheless, we should not forget that the Klinger Volume Oscillator is a leading indicator, which makes it inefficient as a standalone indicator. In this article we will cover three indicators you can combine with the KVO indicator to increase your odds of success. You open a position whenever the KVO line breaks its 13-period SMA but only if the Stochastic Oscillator gives a signal in the same direction (overbought or oversold). You close the position whenever the KVO crosses its EMA in the opposite direction, but only if the Stochastic gives a signal, which is opposite to your position. An interesting point regarding the Klinger Volume Oscillator is that you are always in the market, because the open and the close signals are identical. Meaning, whenever you close a position, you should open a counter position. Note that this is more of a short-term trading strategy and is more effective on smaller-period charts. Since you are going to be in the market most of the time, you will accumulate big volumes, which will result in many losses and many profits. The point is to keep your win ratio slightly higher. This is a 15-minute chart of Microsoft from September 4-11, 2015, showing 5 positions, which I take according to the strategy described above. We have three long and two short positions, where the only unsuccessful one is the last long. The total profit we get here is about $2.80 per share. This is again illustrative, but the main point to take away is that you are constantly in the market. Experience has shown me over the years, that systems requiring traders to always be in the market are hard to maintain, because you will try to start picking the winners from the losers. This selective process overtime hurts your ability to benefit from the law of averages and ultimately results in a downward sloping equity curve. The combination Klinger plus the Parabolic SAR is not very common among day traders. Yet, I find it effective, because of the difference between the two instruments - the KVO is a leading indicator while the Parabolic SAR is a lagging indicator. As we previously stated, leading indicators give many false signals. For this reason, we now add a lagging indicator, which will isolate a big part of the KVO head fakes, thus shedding light on high probability trades. Remember that as a typical lagging indicator, the Parabolic SAR needs a closing price before printing a dot. This is a 60-minute chart of Bank of America from the month of October 2015. The example shows how we get 7 signals to take a position in the market, but thanks to the Parabolic SAR, we isolate only three of them where we actually open a position. Therefore, out of three positions, we had 2 successful and 1 unsuccessful trades, resulting in a total profit of $0.90 per share. The key positive for this trading strategy is that you are not constantly in the market. As a trader, you need time to take a breathier and digest what is in front of you, in order to avoid trading fatigue. Like anything in life, if you try to complete a task when you are exhausted, your quality of work will suffer. In this trading strategy, we place two moving averages and volume in addition to our Klinger Indicator. We are going to open positions only when (1) price closes above both moving averages, (2) the KVO line is on the same side of its 13-period EMA and (3) there is a surge in trading volume. This is a 10-minute chart of IBM showing its price movement from October 22-27, 2015. We have included our Klinger Oscillator, 15-period SMA, 20-period SMA and volume. The first circle on the Klinger Volume Oscillator histogram shows us the moment when the KVO line crosses its 13-period EMA in a bullish direction. This happens during relatively high volumes. At the same time, the price of IBM just switched above the two SMAs, which cross each other in a bullish direction. Long we are! We close our position with the first candle outside the 15-period simple moving average (red). The next position is unsuccessful. We get pleasant market conditions for a short position, but contrary to our idea, IBM starts gaining and we close shortly thereafter. This is the moment when the volumes start playing their most important role. As you see in the upper blue rectangle, volumes are low. At the same time, the KVO line acts erratically and gives numerous false signals. Since the volumes are low, we do not take these signals under consideration. We do open a short position when we get the next big volume candle, price closes beneath the two SMAs and the KVO crosses beneath the 13-period EMA. This scenario repeats once again triggering our fourth position. So, here we opened 4 positions where only one was unsuccessful. The other three positions resulted very positively to our bankroll - with a total profit of $3.4 per share. The Awesome Oscillator looks calm in comparison to the KVO, which appears rather chaotic. However, the Klinger Oscillator provides a greater number of trading signals because of this dynamic. Some of the signals are false, but there are secondary tools you can use to validate the trade signals. After all, you will need to use validation tools with the Awesome Oscillator as well. So, why not take advantage of the indicator which provides more signals? This is a 10-minute chart of Facebook, showing the price of the security from October 22-26, 2015. The Awesome Oscillator in the lower part of the image shows 8 saucer formations. Notice that all the Saucer places completely match the parameters of the blue bullish trend line and at the same time, its corrections. The trend line is well contained by the saucers until the Awesome Oscillator switches below the zero level and at the same time, the price of Facebook creates a bearish gap. The Awesome Oscillator is also good for discovering divergences and drawing chart patterns on it – pretty much like the Klinger Volume Oscillator. However, the truth is that these two trading tools are very different. First of all, the KVO is a volume-based oscillator, while the AO is about determining the price’s momentum. Second, the KVO consists of two lines, while the AO is a bar histogram with red and green bars. Third, the movement of the KVO is relatively more fluctuating, because this indicator represents the inconsistent trading mood of the participants in the market in different time frames and market overlaps. Honestly, out of these two trading instruments, I prefer the Klinger Oscillator more. The reason is the level of detail it displays, makes you prepared for every trade opportunity. I believe that if you combine the Klinger Oscillator with the right technical indicator, you will uncover more trading setups than if you used the Awesome Oscillator. The Klinger Indicator is a volume-based oscillator. It consists of two lines, where one of them is very dynamic. Its basic signals are the interaction between the two lines and the divergence. The KVO is not a good solo player, because it is a leading indicator. KVO gives more signals than the Awesome Oscillators. Many of these signals are false and should be validated by a secondary tool. In this manner, KVO gives higher number of accurate signals too. KVO will keep you busy!